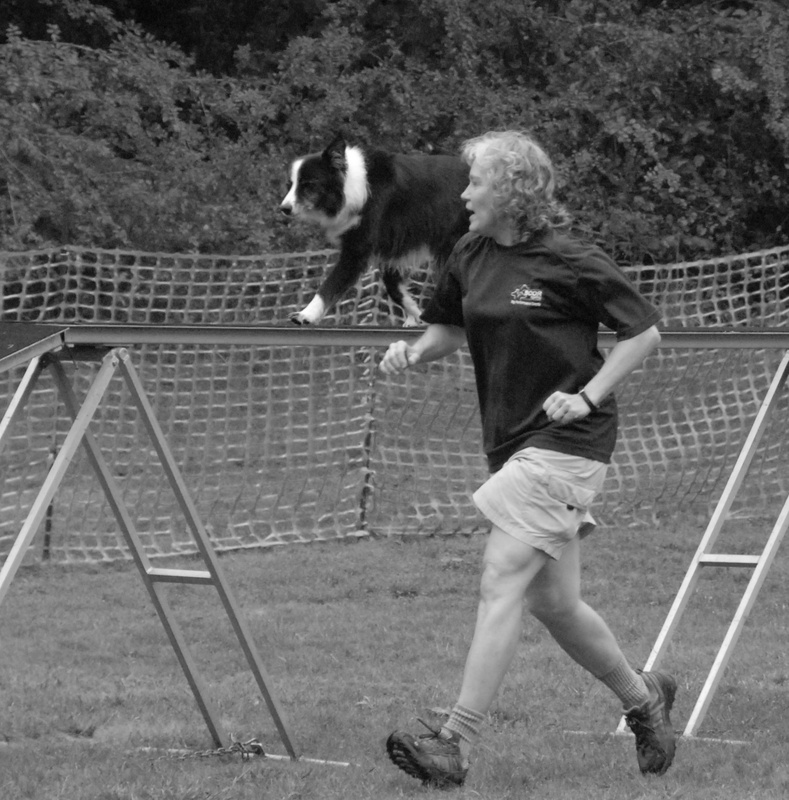 After running our last agility competition indoors, coming back to Scraps’ home field at St. Huberts should not have been a problem, but it was. In actuality Scraps and Kathy worked really well on day 1, communicating and executing obstacles. The problem came where Scraps became distracted by smells and items hiding in the grass. 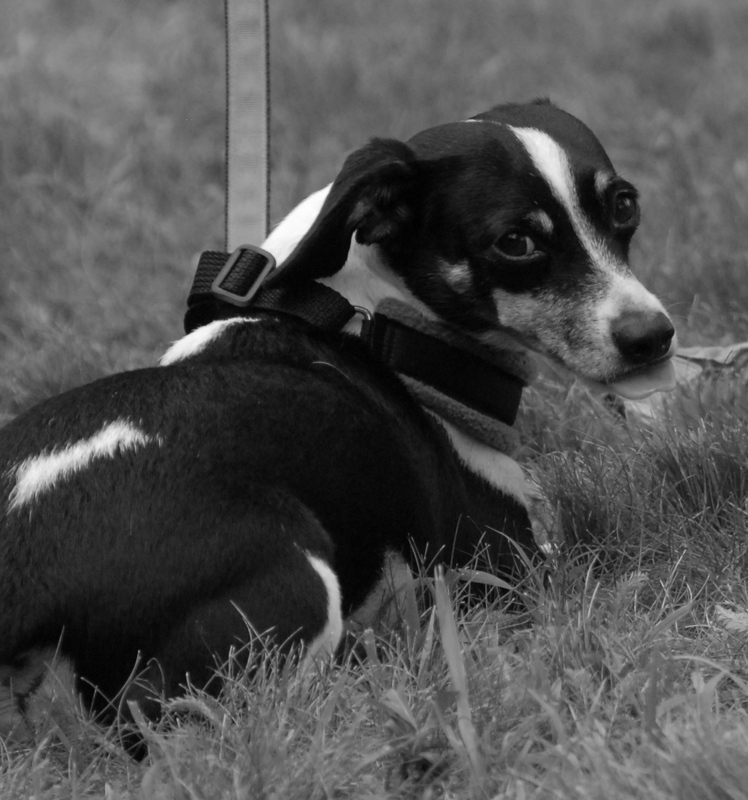 He is small and runs with his nose to the ground, so when a distraction lurks between the blades of grass, he tends to bite on the bait. 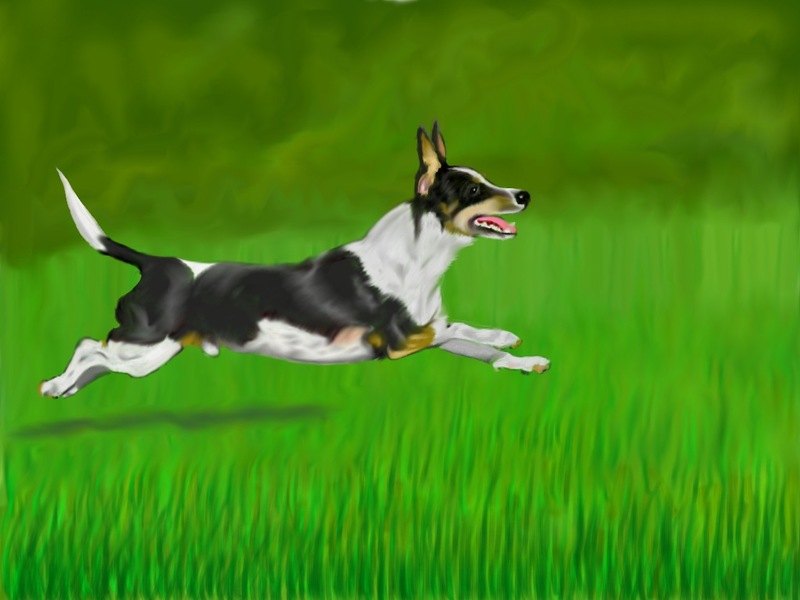 In at least 3 events Scraps stopped to sniff the grass, in all cases Kathy miraculously was able to get Scraps’ attention back and complete the courses but on three occasions, they lost too much time and Scraps didn’t qualify due to it. I want the rubber matting of the indoor course back! 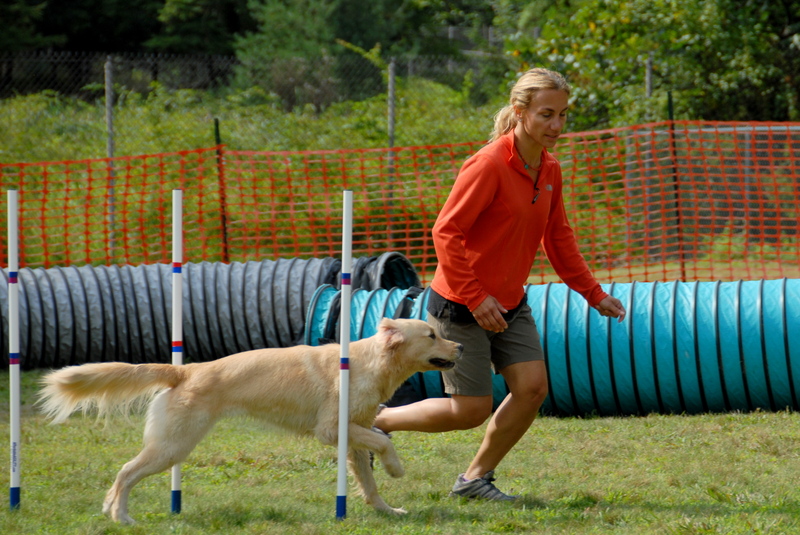 Being late August in New Jersey you have a chance of encountering hot and humid weather, that could tire you out and make a fun agility trial into an endurance competition. This was not the case on day 1. The day proved to be delightful. Low humidity, temperatures in the upper 70s to low 80s with a hazy cloud cover. Temperatures were as good as they get, we didn’t even deploy the side tarps for the easy-up . Also being late summer meant lots of people were on vacation, away or just not interested in so many trials in a short time-span in such close proximity to each other. This was not the case for us whatsoever. It did mean for the first time I recall that the trial didn’t sell out and the attendance was probably 60% of what is usually is. This meant Scraps was done with his 6 events by 3:00 ad I was on the road biking home by 3:10 and showered and blogging by 3:40. Though we went 3 for 6, a 50% qualifying ration, it was a nice and easy day. It all starts again tomorrow with at 6:00 wake-up. Time for a schlagel or 2, dinner and probably a movie that I fall a sleep on the couch during. Hoopers – Novice – 12″ – Course Time 40.80 sec. Weavers – Novice – 12″ – Course Time 59.20 sec. Tunnelers – Open – 12″ – Course Time 31.20 sec. Chances – Novice – 12″ – Course Time 40.00 sec. Regular – Novice – 12″ – Course Time 61.52 sec. Jumpers – Open – 12″ – Course Time 33.60 sec. 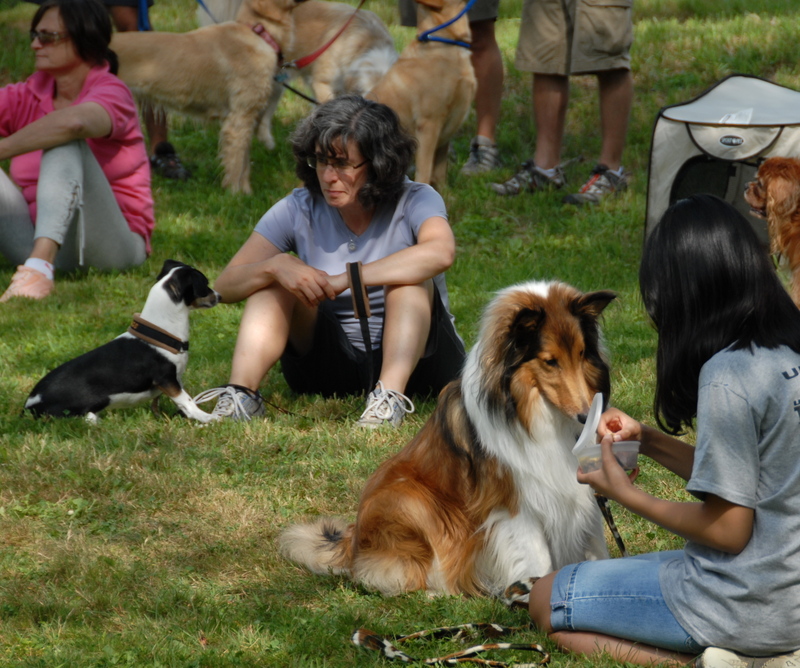 While Saturday presented itself as a picture perfect day to be hanging around an agility trial, Sunday was threatening to be a little more challenging. With Scraps not liking the rain whatsoever we were going to be lucky to pull out a couple of Qs. The weather G-d was on our side so we lucked out a bit. There were periodic drizzles and minor rain episodes throughout the day but nothing to impact our runs. It was like there was someone looking after us. Let me put it this way. Weavers was the last event of the day and since the trial wasn’t full and people didn’t hang around due to the weather, we were completing our last run at a very early 1:30. At 1:40 it began to pour. If that wasn’t lucky enough, we qualified weavers the day before and moved up from novice to open for Sunday. Now Scraps is pretty new to weave poles and moving up to open where he would face 12 poles instead of 6 seemed like a difficult hurdle to overcome. Before the run we were kind of bummed that we actually moved up. We didn’t think Scraps had 12 weave poles in him being the 12th run of the weekend, pending rain and all, but somehow as he was losing focus on the 10th weave pole, he got a grip and pulled the Q out his his cute little behind. Check out the video below and that’s what I mean by someone was looking out for us. On the brighter side of things, Scraps was making all his contacts and took all his tunnels. These had been surprising problems in the last couple of competitions. Weaves are also getting pretty consistent as long as we enter him on the proper side. Somehow Scraps knows what a hoop is and knows how to go through them. I’m pretty amazed at that since he never sees them accept for NADAC trials. As soon as Scraps finished his last run, the skies opened up. Fortunately, I acted quickly and got the clear stream garbage and recycling racks into the care before they got too wet; same thing with the two bulky gravity chairs. When the rains came down it flooded the ground with the underbrush turning to a fiber-rich soup that penetrated my shoes.About 10 of us were there helping Mary and Pat (SCOR) and Pat and Carole (St Huberts) get cleaned up and get the field back to how St Huberts needs it. We did most of this clean up in torrential downpours when staying dry wasn’t an option. Wouldn’t you know, as soon as we got done and all the cars and trucks were packed, it stopped raining. Someone with a rye sense of humor was looking down upon us. In closing Scraps got 4 of 6 Qs on Sunday. Pair those with the 3 for 3 on Saturday and we have him coming in at 7 Qs for the weekend’s 12 runs. At this point, we don’t have another trial set until October so we should use the time and practice a little what we don’t do all that well and rack up a few CPE Qs in the Fall. Jumpers – Open – 12″ – Course Time 27.67 sec. Hoopers – Novice – Course Time 40.80 sec. Regular – Novice – 12″ – Course Time 57.60 sec. Touch N’ Go – Novice – 12″ – Course Time 63.14 sec. Weavers – Open – 12″ – Course Time 61.37 sec. 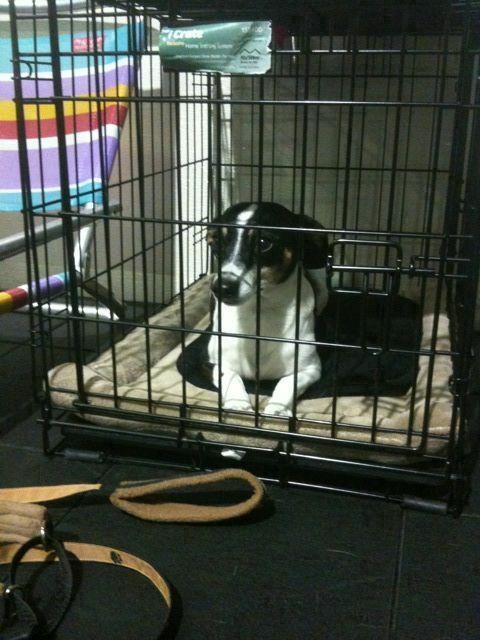 Scraps is liked a caged gladiator ready to go. It’s early August and we have beautiful weather for this weekend’s trial. Fortunately or unfortunately, as you may see it, this trial is indoors and air-conditioned. While it is cool and comfortable is it a bit depressing not being out in the nice weather. Additionally, since the ring has no spectator access or natural lights, photographs are not going to be part of this posting. I am lucky enough to get video of the runs. Nevertheless, with the trial being held at the K9 Campus in Randolph, which is a convenient 25 minutes from home, does have some redeeming features. Did anyone mention indoor plumbing? 1st place – Qualifying – 0 faults – 23.63 sec. 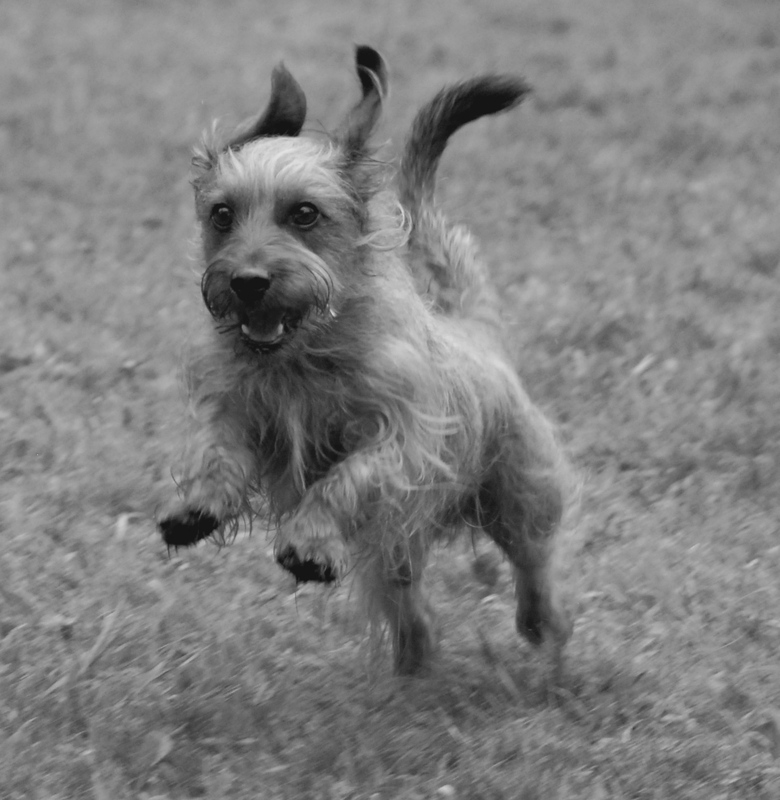 Scraps was the fourth dog to run in the day and he seemed ready. The first run in colors was slow and smooth, which is a good thing. It gave Kathy and Scraps the time to call him away from going over and errant obstacle in the middle of the run and finish with a Q. So I think, the results haven’t been posted yet. Just got the results and we did get a Q and a 1st place. Snooker was the second run and that ended early with a disqualifying whistle as Scraps went through two of the same colors in a row, and that is a “no-no.” Oh well, so far we are 1 for 2. This was the last run I would watch before I drove home to walk Rags and get lunch. I was also filling in for Kathy doing leash running while she ran with Scraps so I was in the center of the ring as opposed to the door. maybe that was good luck because she and Scraps had a near flawless run. Fast, accumulating lots of points and having Scraps accelerate through the behind the red line obstacles in a quick sequence to complete this excellent run. 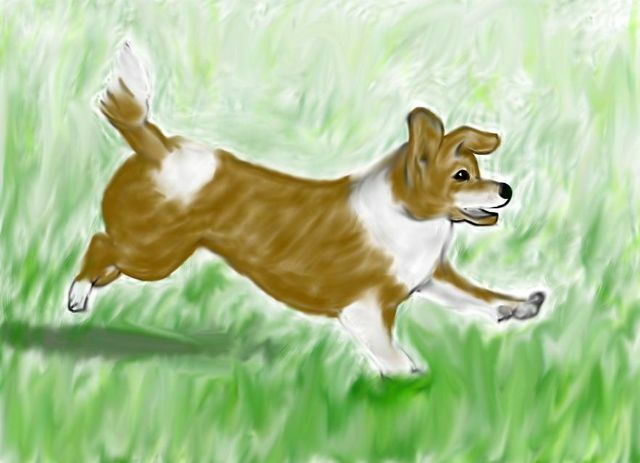 Besides using my iPad to write this during the downtime between runs thanks to the excellent wi-fi signal here at the K9 Campus, I was also able to draw a little, so check out the tracing I did of Rags who waits patiently at home. 1st place – Qualifying – 0 faults – sec. Fourth run of the day seemed as if Scraps and Kathy were hitting their coincidental stride as the flew through the jumpers course slowly and in control to pull out a fast time. It’s like how a golfer can hit the ball further with a slow in control swing vs. a frantic powerful stroke that doesn’t go as far. Great run! Last run of the day being built and we should be out of here by 4:00 and home by 4:30. That’s nice considering we were here at 7:00. They got through this last run also fast, in control and with lots of points. Good finish to the day at 3:30 pm. Time for a nap, bottle of wine and to prepare to do it all again tomorrow. Drawn during the trial with my iPad using Art Studio app.